﻿When I was 14 years old my family and I went on summer vacation in Breckenridge, Colorado. As we were driving around, my dad admiring the scenery and my mom and I looking for places to shop. My dad pulled the truck over at this oddly shaped shop at the bottom of the Rocky Mountains. As we were walking up I remember being very exciting. Mostly because I love trinkets and souvenirs and this place looked like it was going to be a treasure chest of unique souvenirs. When I walked in all I remember seeing was this huge pit of what I thought was lava, but turned out to just be a very large kiln. I watched these ZZ Top looking men blow glass. This was something I had never seen or heard of before so the fact that these men were twisting and turning these huge balls of fiery glass really caught my eye. I remember my favorite part about the glass blowing was the end product. It is so surprising and something I never expected. 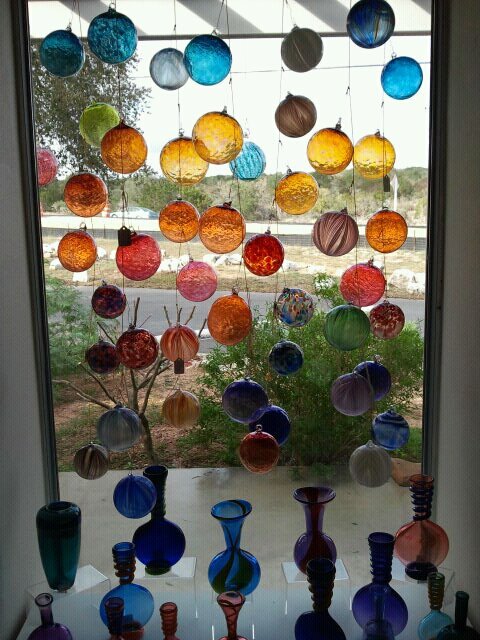 Luckily you can have a glass blowing experience of your own right here in Texas. Located between San Marcos and Wimberley on Ranch Road 12 is a big yellow and green building that reads "Hand Blown Art Glass Lighting". You can't miss it; It's the only building for miles. Owner and artisan Tim deJong, was born in Sesketchewan, Canada. He Graduated from Alfred University in upstate New York where he studied ceramics, glass, and sculpture. Tim deJong came to Texas on vacation in 1991. He fell in love with the hill country and decided that Wimberley, Texas is where he wanted to spend the rest of his life. He bought some property and the out of towner created Wimberley Glass Works in 1992. Wimberley Glass Works started out in a small shop with just a few lawn chairs for spectators to watch him blow glass. These days Wimberley Glass Works has moved into a very large shop with seating for 45 people. ﻿ Exploring the showroom, which is filled with fragile vases in every shape and size, sconces small and large and in every color imaginable, glistening floor lamps, multicolored chandeliers, and hand blown chess pieces that look like they each have their own tiny universe. I had my purse clutched tightly underneath my arm, and I gave myself a little pep talk about how extremely careful I was going to be. What caught my eye in the display above were the colors reflecting off the ornaments. I took this picture on a rainy day so I can only imagine what they would look like on a sunny day. The display below is many separate pieces displayed together to make one big beautiful piece. 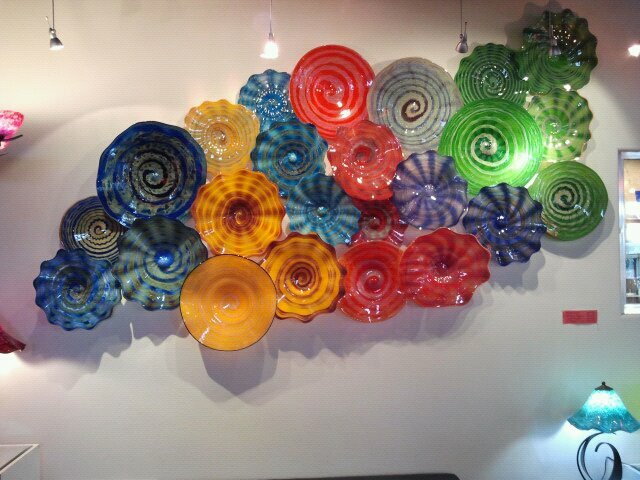 When not hanging on the wall in Wimberley Glass Works these also serve as bowls and plates for home decor. It is safe to say that Tim deJong and his three other glassblowers have found their niche, light fixtures. 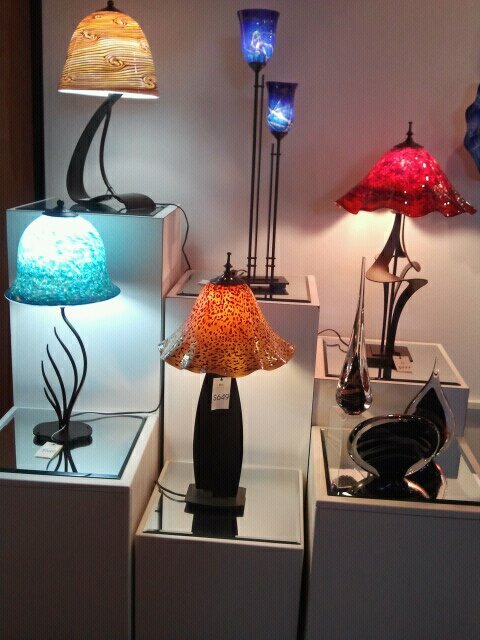 Lighting is definitely what Wimberley Glass Works specializes in. Inside lamps, outside porch lights, night lights, chandeliers, and even custom lighting. You explain what kind of light you want or need and they have it. If not they will gladly make it for you while you watch from the bleacher seats in the studio. Watching the glassblowers at work is a completely FREE and an unforgettable experience. They way they work the glass in a team effort for every piece is just incredible. The glass blowing artists at Wimberley Glass Works are some of the nicest people I have ever met. After each demonstration they will undoubtedly answer whatever questions you have for them. If you never seen someone blow glass before I encourage you to go check it out. Their work is astonishing and just an experience all together. Anytime you have a chance to watch someone make art you should absolutely see it happen. The glass blowing demonstrations are held on Tuesday through Saturday 10:30 to 4:30. I really enjoyed your blog! I was immediately drawn to the window piece you have posted on your blog and I adore blown glass art work. I have seen this place on my way to Fredericksburg many times but I did not know anyone that had been so I had no reviews to go off of. You have motivated me even more to go check this place out. I really enjoyed reading your blog but I enjoyed the pictures even more. These men have some absolutely gorgeous pieces in their shop! I, Like Kristi, was drawn to your blog out of curiosity. I have driven by Wimberley glass works several times and always wondered what was inside. Thank you for sharing and I can not wait to go visit and see that wall of plates in person. I really loved this because it struck home to me. My dad took me to a shop that had glass blowing once when I was eight. I remember having the same feeling as you did. I have driven by this place a lot and have always wanted to stop but never did. I cant wait to go now. Everything is so beautiful, and colorful, the way the glass catches the sun is incredible. Im really happy you did this and I will be checking it out very soon. I've driven past the shop so many times and I've always wanted to go in, I just didn't because I knew I could never afford anything. I love that you included a time for people to go in and watch because that would make me feel a lot better about leaving the shop empty-handed! The video is very cool too,I want to go check it out so bad! Glass is such an awesome medium! Ive always wanted to get involved in producing art glass, and this blog post just enhances that feeling. Ive driven past this curious building a few times, just like many others and have always wondered what it was like inside. I believe I might stop by soon to check it out myself! Glass is so unique, so delicate yet strong. I like everyone else find this blog post to be very lovely. 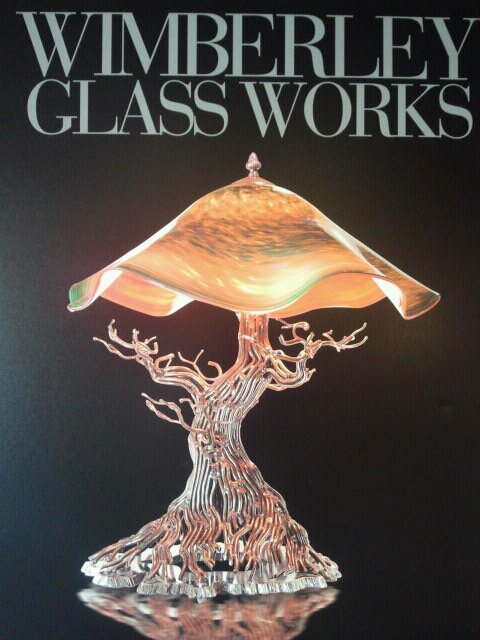 Glass blowing is such a beautiful art and I definitely would not mind learning the craft. It is something that I can really appreciate. Personally I have not had the chance to stop by the shop, but I indeed will make a trip out there. wow, so beautiful, it's amazing what you can find in your own backyard! I have to go see this place for myself now! Glad you picked this!